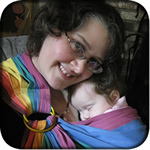 sleeping baby productions | Is my sling safe? Car seats and safety: Car seats are the ideal protection for your baby in a car. However, they are far more unsafe to use than a good baby carrier outside the car.